Marvin Miller, Professor Emeritus of Chemistry and Biochemistry, has been selected for induction into the American Chemical Society (ACS) Division of Medicinal Chemistry (MEDI) Hall of Fame during the 252nd ACS National Meeting in Philadelphia in late August. 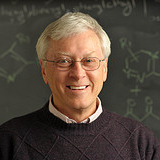 For nearly 40 years, Miller has made countless contributions to medicinal chemistry, focusing on a mixture of synthetic organic chemistry and bioorganic chemistry to develop new methods in an effort to study, prevent, and cure diseases, particularly targeting tuberculosis and bacterial infections. His pioneering work on developing synthetic techniques for ß-lactams remains the most effective, practical, and versatile method for their preparation and allows for complete control of peripheral functionality and stereochemistry. Miller also discovered that analogously substituted imidazopyridines and imidazothiazoles are potent and exquisitely selective anti-TB compounds that target selective inhibition of mycobacterial respiration. This work is being investigated further to develop low-cost, highly-selective anti-TB pharmaceuticals. Professor Miller joined the Department of Chemistry and Biochemistry in 1977 after receiving a Ph.D. in Bioorganic Chemistry from Cornell University and following postdoctoral work at the University of California-Berkeley. In 1996, Miller was named the George & Winifred Clark Professor of Chemistry and Biochemistry at the University of Notre Dame and in 2016 was promoted to Professor Emeritus. Befittingly, two of Miller’s former students have also been inducted into the MEDI Hall of Fame. John Macor was inducted in 2014 and Ann Weber was inducted along with Miller in 2016, a testament not only to Miller’s own contributions to chemistry but to the lasting impact he has made on subsequent generations of chemists as well.